Posthumous Adaptations: See-Saw, 2017. Concrete, foam, metal, wood, clear tubing, water bladders, water. Dimensions variable. Entropia, 2017. HD, 16:9 format. 5:13 min. Home Demolition as a Rocking Horse, 2017. Paper, concrete, wood, plastic tube and syringes, wheel and water. Dimensions variable. 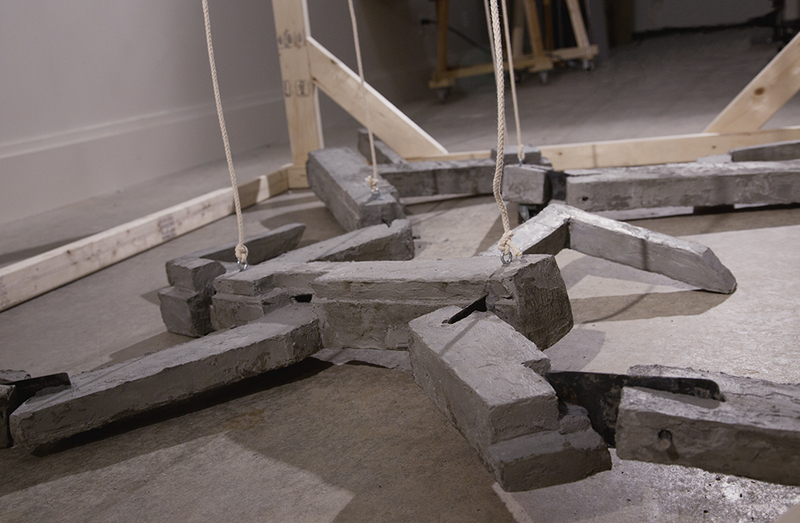 Video documentation of Floor Mariontette #2, an interactive sculpture intended for operation by two people at a time. Floor Marionette #2, 2016. Wood, metal, papercrete and string. 52 x 37 x 32 inch. Entropia, 2016-2017. Video and stop motion animation. HD. 16:9 format. Duration: 5:13 min. 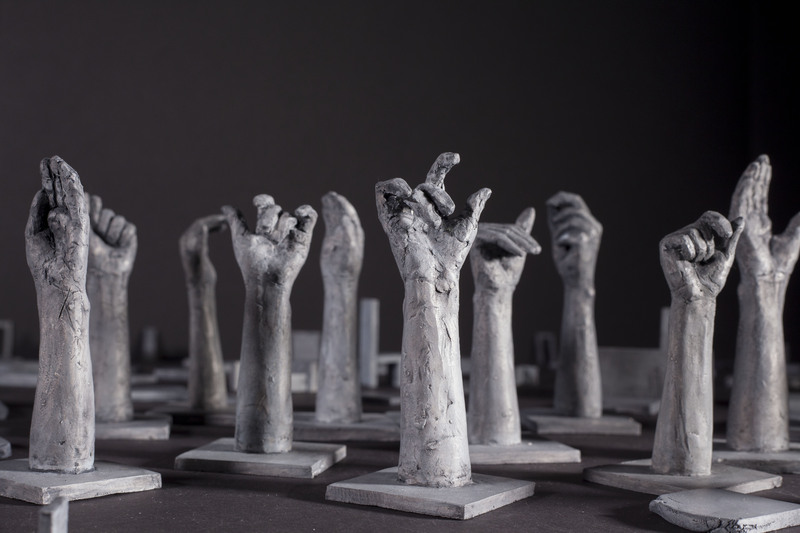 The images in this project are taken from a stop-motion animation video, which is a work in progress. Excerpt from stop-motion animation video, work in progress. 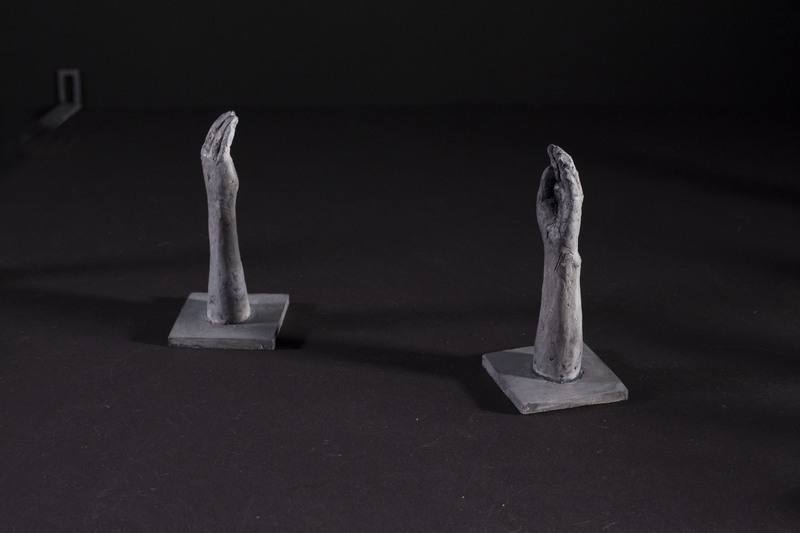 Image from Stop Motion Animation video, work in progress. “Public Operations” is an interactive, site specific installation which I like to think of as a large ‘architectural marionette’. It was made for the 2016 Akimbo Dance Festival, and designed for the Baltimore North Station Tool Library, a community center that offers woodworking workshops and from which members of the community can borrow tools for their own use. 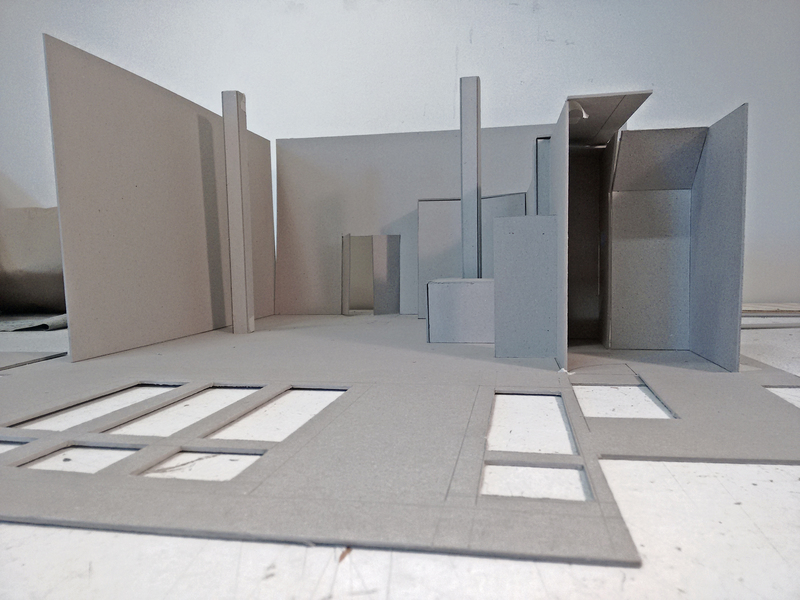 The forms that comprise the piece are based on the architecture of the space. 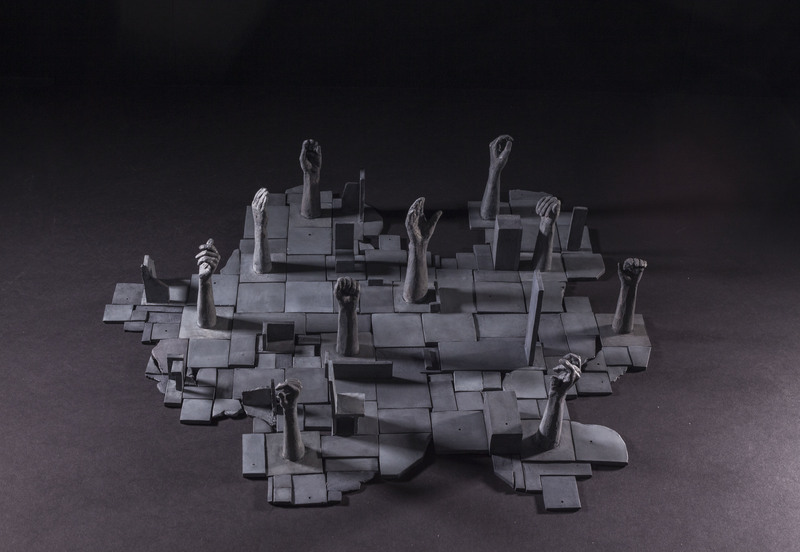 They are made of papercrete and steel and are connected to each other with handmade hinges, creating structures that rise and collapse according to their operation by the public. Some structures demand the cooperation of several visitors, and some are placed far from the handle that operates them, creating movements in unexpected parts of the space: elements around one’s body might move as a result of one’s own act, or the act of a total stranger. In the context of a dance festival, both the architectural elements and the visitors who moved them became dancers, and the act of building and constructing- a dance. 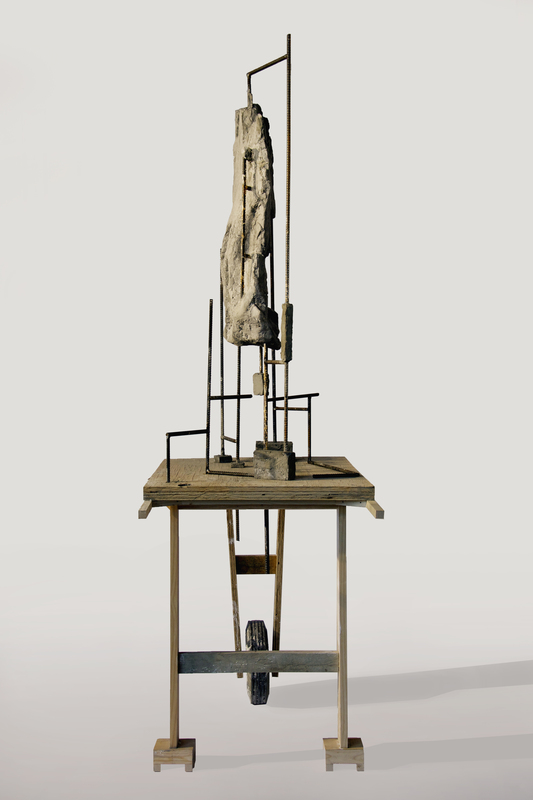 In the context of a marionette sculpture, the characteristics of concrete as a material that represents rigidity, monumentality and permanence were enhanced and challenged. Marionettes are often referred to as “the mask from which the human actor has completely withdrawn”. In “Public Operations” I attempted to pull the puppeteer back to the stage, while also returning movement to concrete and engaging the public in a silent dance in which everyone is influenced and influential. Video documentation of the interactive, site-specific installation made for the Akimbo Dance and Movement Festival. The show took place in the Baltimore North Station Tool Library, September 2016. 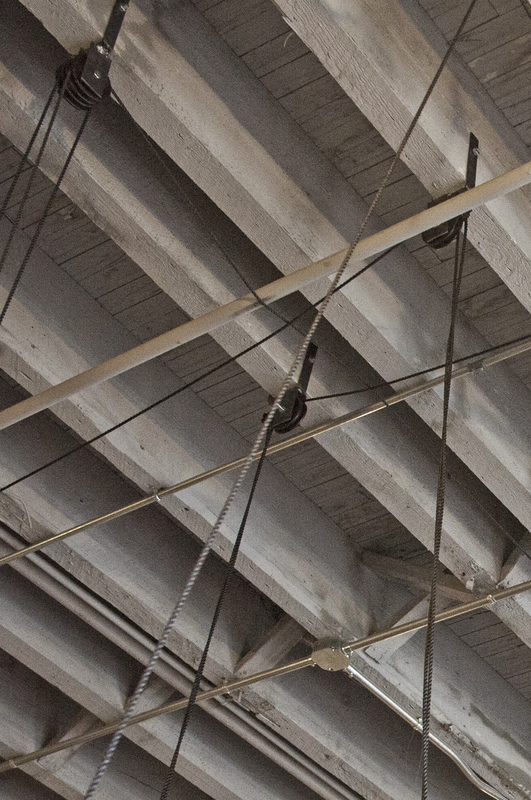 This close-up image of the ceiling shows the block and tackle pulleys, fabricated by the artist for this project. Public Operations, 2016 [setail]. The forms in the image are based on the architecture of the Station North Tool Library. 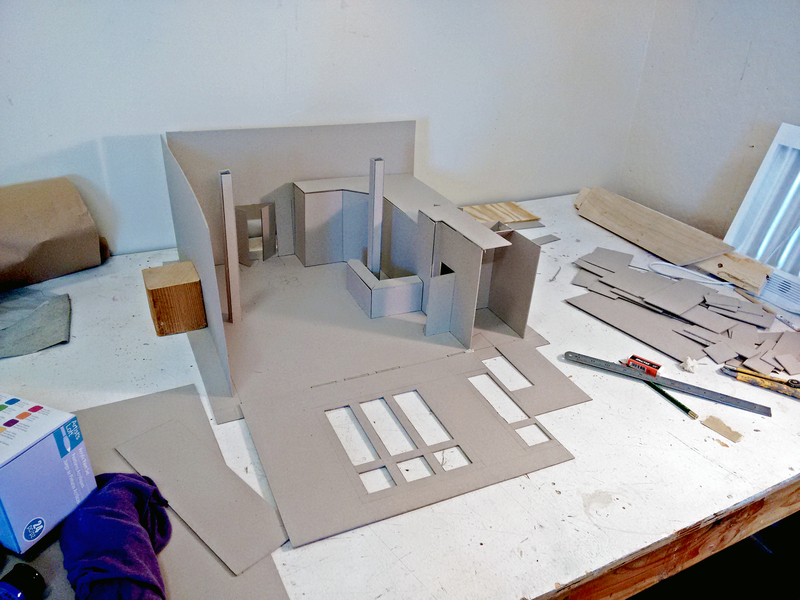 Model of the Station North Tool Library, 2016. Cardboard and masking tape. 13 x 22 x 19 inch. Scale: 1:15 inch. Floor Marionette #2, 2016. Wood, papercrete, metal and string. 52 x 37 x 32 inch. This video is a documentation of an interactive sculpture, intended for operation by two people at a time. 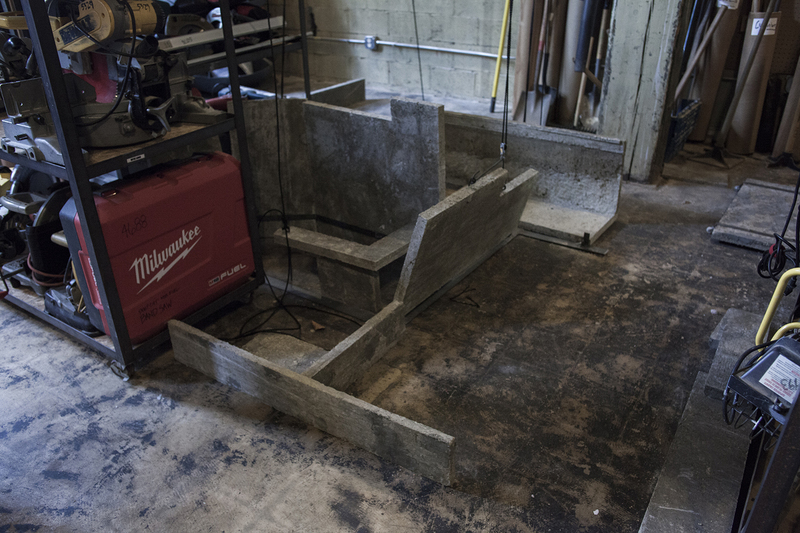 The stage upon which the piece is placed acts as a sound box, amplifying the sound created by the manipulation of the pieces. Floor Marionette #2, 2016. 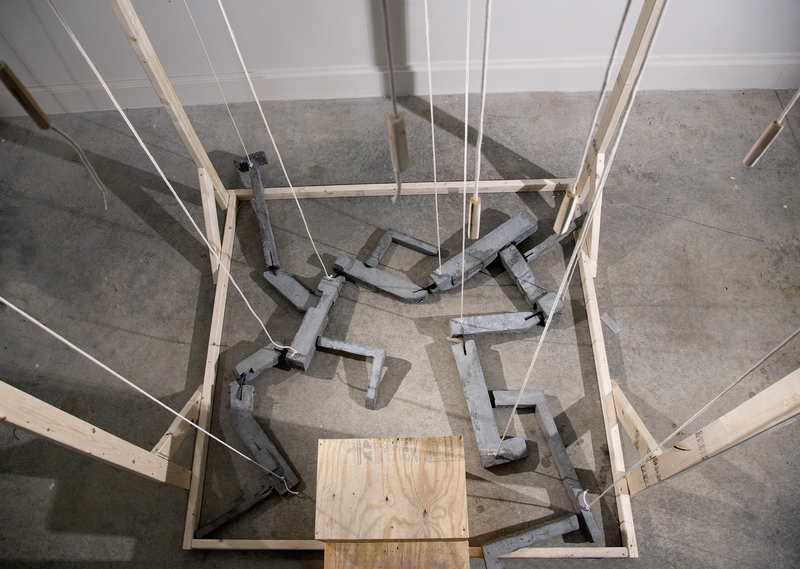 An interactive marionette sculpture, intended for operation by two people at a time. For a documentation of the sculpture in action, please view the video attached in this project. Floor Marionette #1, 2016. 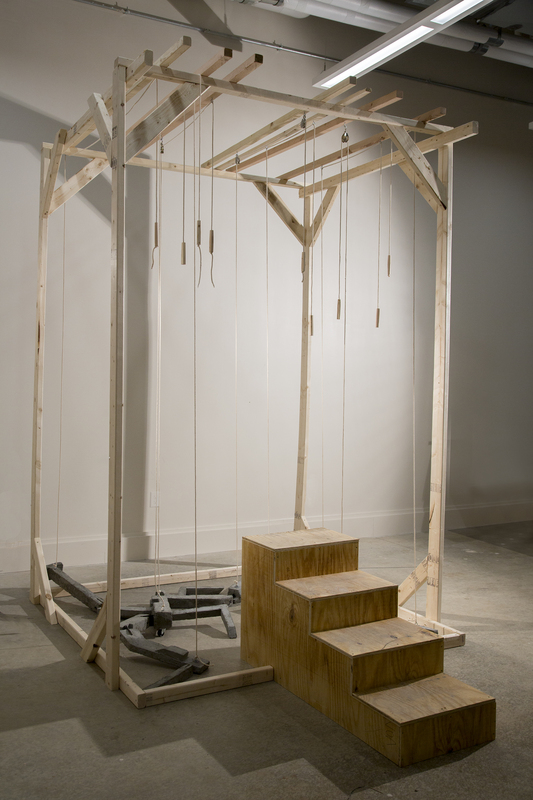 Wood, concrete and fiberglass, foam, wheels, rope and pulleys. 110 x 71 x 115 in. 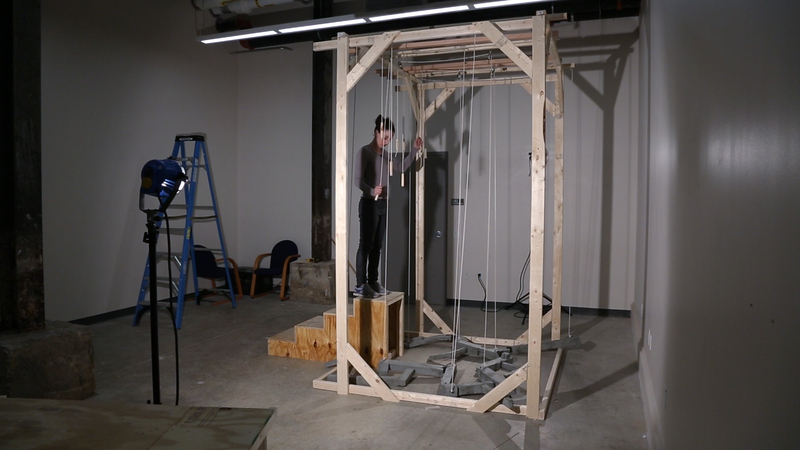 This video is a documentation of an interactive sculpture, intended for operation by one person at a time. With "Floor Marionette #1" I invite the visitors to climb the stairs and take the position of a puppeteer, look down at the architectural structure and be in full control of its manipulation. 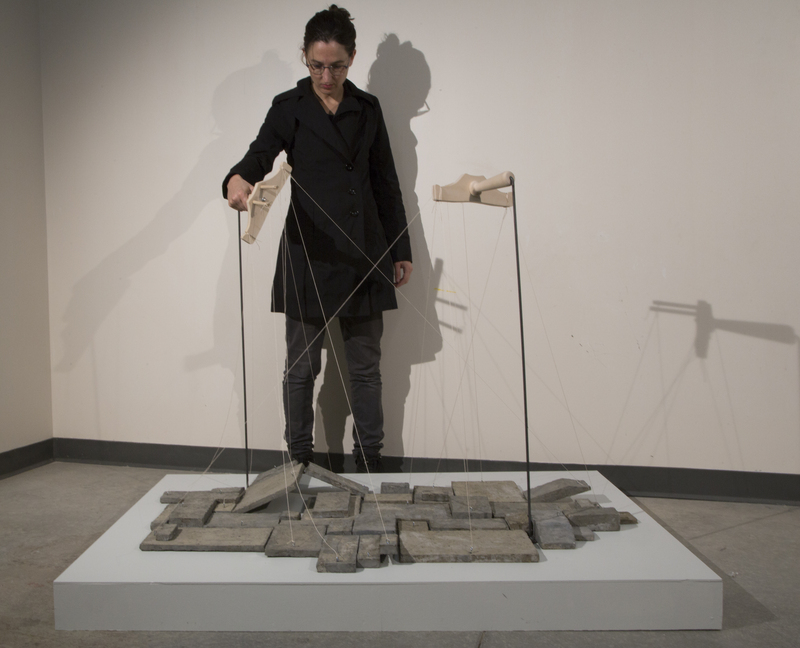 In this sculpture as well as with my other interactive, marionette-like pieces, I attempt to bring back movement to seemingly still and permanent architectural structures, while questioning the role of individuals as audience, participators, activators or full manipulators of their space. Floor Marionette #1, 2016. Wood, concrete, foam, metal, rope and pulleys. 110 x 71 x 115 in. This video is a documentation of an interactive sculpture, intended for operation by one person at a time. With this piece I invite the visitors to climb the stairs and take the position of a puppeteer, look down at the architectural structure and be in full control of its manipulation. Flood, 2016. Stop motion animation video. HD. 16:9 format. Duration: 5:27 min. Flood, 2016. Stop motion animation video. HD, 16:9 format. Duration: 5:27 min. This piece was made upon invitation to the show "The Benevolent Tree" at the Umm El Fahem gallery, curated by Daniel Cahana. 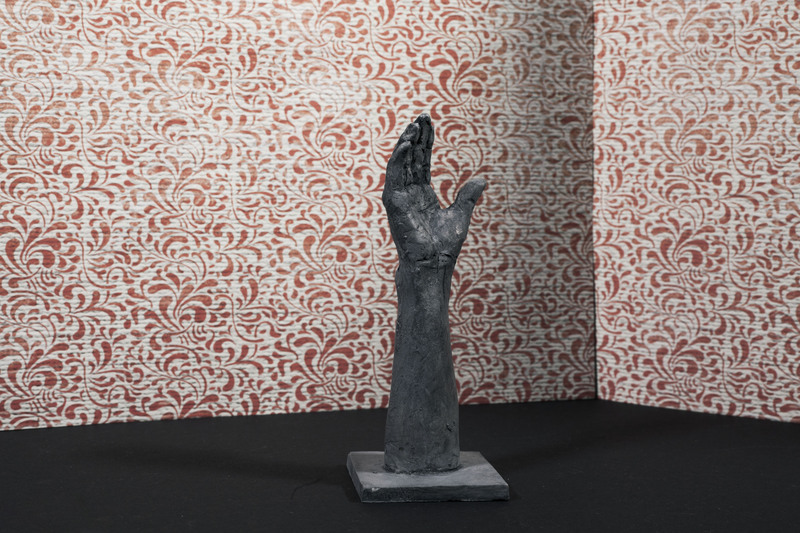 It was shown in 2014 and remained on permanent display at the gallery, upon the gallery's request. In Israel and Palestine, the olive tree symbolizes roots and adherence to a land. Being a popular symbol, it has turned through the years into a highly sought after decoration. As such, it is grown in commercial gardens and then uprooted and transported to foreign soils. In some severe cases, trees which are a hundred years old or more are stolen from Palestinian lands under Israeli occupation, to be sold for profit. 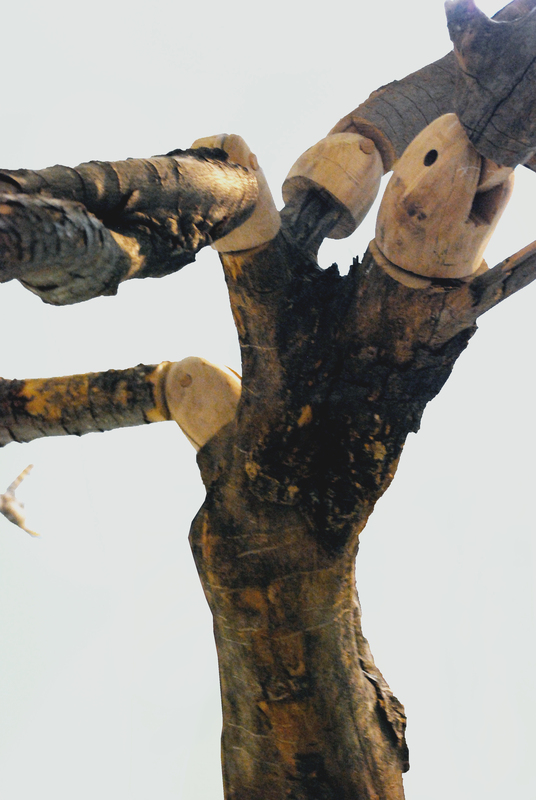 The sculpture is made of olive tree parts, joints that were carved out of olive tree wood, rebar, string and a ladder. The joints are fully functioning, though in this piece the audience cannot move them. 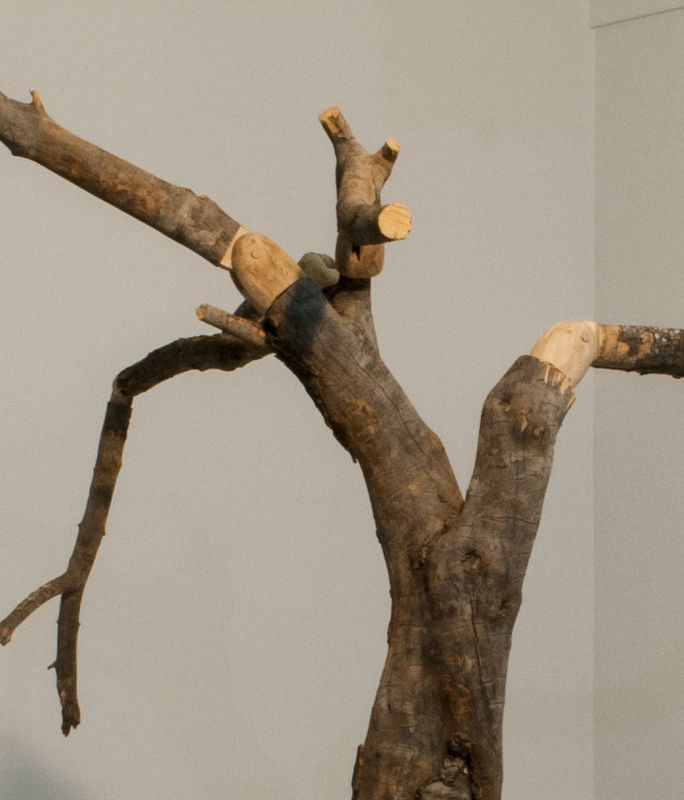 The branches and stem were collected from trees that were uprooted from a garden in Jerusalem after a decision was made to redesign it; those same trees were previously removed from their original location to be replanted in this garden. 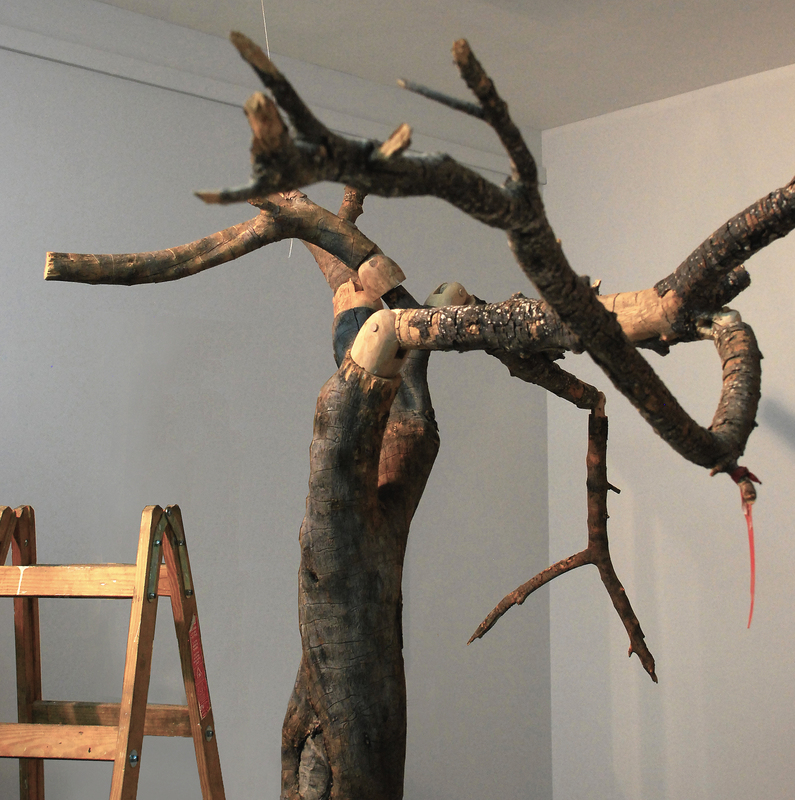 The red ribbon on one of the branches is a remainder of the marking system of the trees chosen for removal. 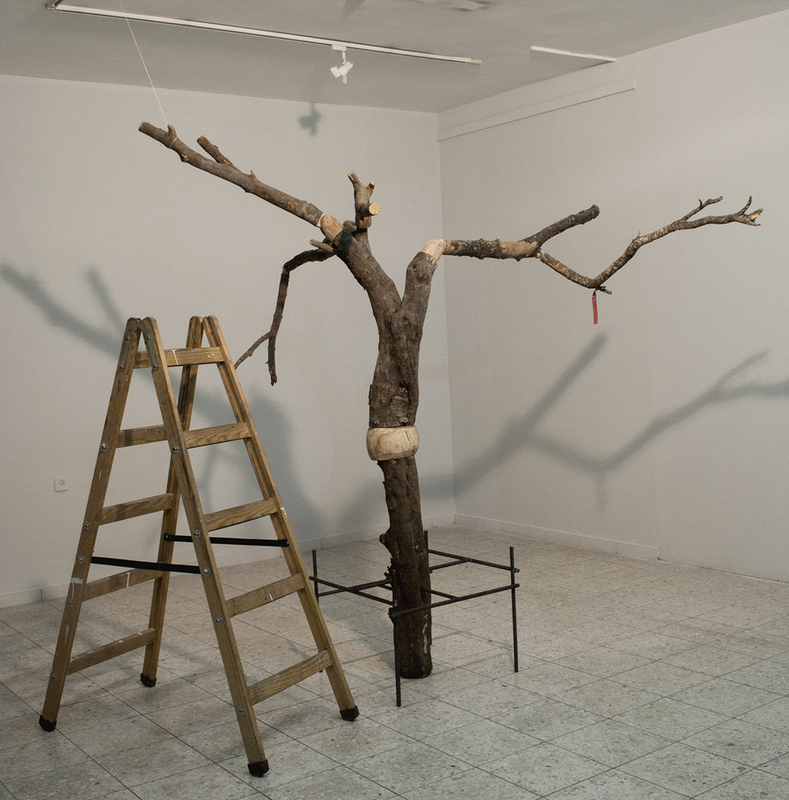 While the turning of the tree to a marionette suggests the exploitation of it as a natural resource and as a traditional symbol, the ladder is brought it to give a human scale and remind one of the absent fruits. 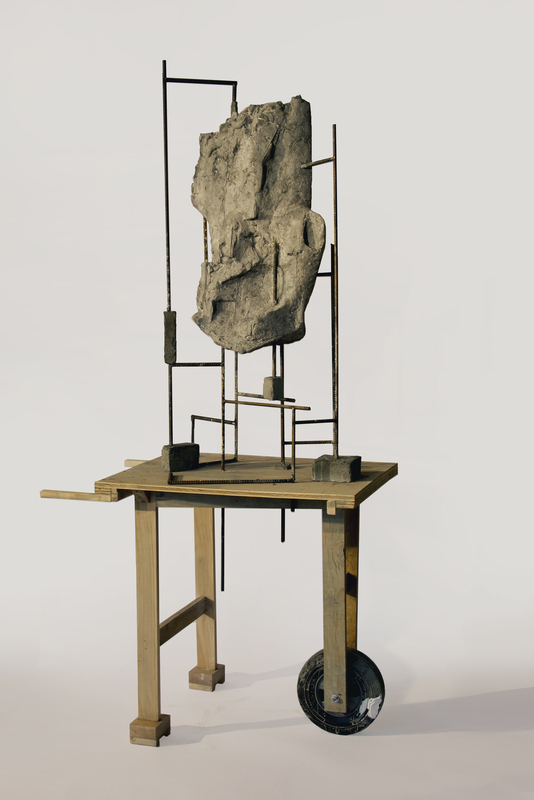 This work was made in collaboration with carpenter Tom Attias, 2014. Weathered Like a Rock, 2015. 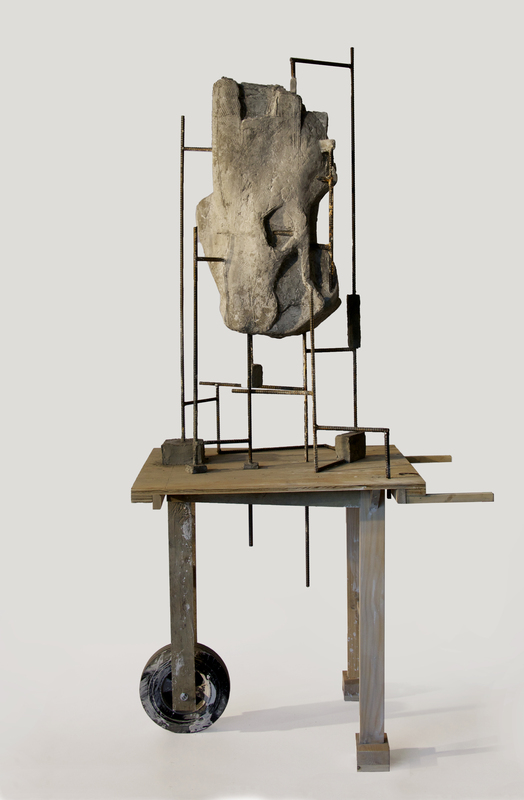 Concrete, fiberglass, metal rods, wood and a wheel. 79 x 30 x 24 inch. Weathered Like a Rock, front. Weathered Like a Rock [back view]. Weathered Like a Rock, back view. Weathered Like a Rock. side view.